Li Miao voted on a poll in the group ¡ POETRY ! GOODREADS MAY 2016 NEWSLETTER TOP FINALISTS' POEMS -- PLEASE SELECT ONE! * Voting is anonymous and choices are listed randomly. Thanks, as always, to our judges, Joan Colby, Meg Harris and Kenyatta JP Garcia f GOODREADS MAY 2016 NEWSLETTER TOP FINALISTS' POEMS -- PLEASE SELECT ONE!
" I learned to swear. " Li Miao made a comment on the poll: GOODREADS SEPTEMBER NEWSLETTER TOP FINALISTS' POEMS -- PLEASE SELECT ONE! CLICK HERE TO READ THIS MONTH'S FINALISTS * Voting is anonymous and choices are listed randomly. Thanks, as always, to our judges, Wendy Babiak, Tara McDaniel and Ruth Bavetta for selecting six finalists from this month's group!
" Hands down for "Overflow." Something there about a dying way of life as well. I can see this in a published collection. " " A strong field here -- my vote goes to Letter by Estermann Meyer. James Cook's is a close second. " We’d love your help. Let us know what’s wrong with this preview of The Chalk Circle by Tara Lynn Masih. 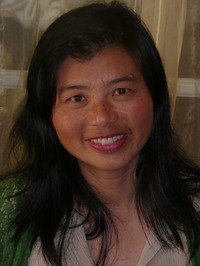 Li Miao Lovett ...more "
Li Miao joined the group ¡ POETRY !